Distinguished visiting professors Paul Light, Martin Feldstein, and Alain Enthoven gave dynamic lectures to Pardee RAND this winter on the topics of government reform and swing voters, measuring real income growth and distribution, and the practice of systems analysis and design. Light, the Paulette Goddard Professor of Public Service at NYU’s Robert Wagner School of Public Service, returned to the school for a weeklong residency in January, during which he gave several talks about the results of the 2016 presidential election and held office hours with students. In his seminar entitled "The Dismantlers Rising: How Government Reform Pulled Swing Voters to Donald Trump's Cause," Light addressed the divide affecting American politics and how it was so difficult for pollsters to predict who would win. Feldstein, the George F. Baker Professor of Economics at Harvard University, president emeritus of the National Bureau of Economic Research, and former chief economic advisor to President Ronald Reagan, gave two talks during his weeklong visit. 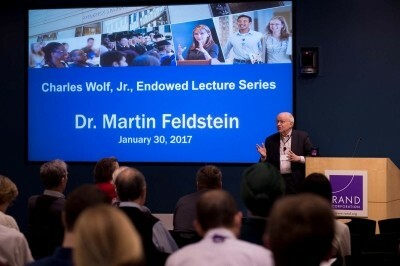 His first talk, "Measuring Real Income Growth and Income Distribution," was open to the RAND research community as a whole and was presented as part of the Charles Wolf Jr. Endowed Lecture Series. A video of that talk is available online. The second talk, "What's Ahead for the U.S. and the Global Economies," was geared toward members of the Dean’s Leadership Circle. 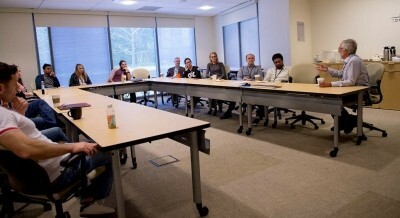 Feldstein spent time with Pardee RAND students and participated in briefings by several RAND researchers including Senior Defense Research Analyst Michael Johnson and Senior Statistician Lara Schmidt. He also hosted a lunch for fifteen Pardee RAND students, who shared their diverse research interests and backgrounds. Dr. Feldstein remarked that he was vastly impressed by the scope and span of the research being conducted by students at Pardee RAND. Enthoven, a renowned economist, is currently at Pardee RAND (March 6–10). A RAND alum who has published widely on defense and health policy issues, Enthoven is the Marriner S. Eccles Professor of Public and Private Management, Emeritus, at the Stanford University Graduate School of Business. 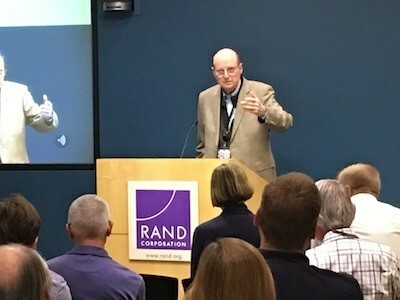 In his introductory talk to students, faculty, and RAND staff on Monday he described his experiences working on system design in two important policy areas — national defense and health — including the methods for systems analysis and policy design. As with the other distinguished visiting professors, he is also holding office hours specifically for students.